It would be a lie to say I am a longtime fan of Maggie Stiefvater’s. I’m not. I made it through Shiver and Linger, but gave up on the wolves after that. Even after hearing her speak at KidlitCon 2010 I wasn’t all gungho about her writing. Then, I read The Scorpio Races, and my mind began to be changed. After this one, though, I have to admit: I’m a fan. There’s just something eloquent in this book: it’s not that its prose is beautiful; I can’t thing of a single passage that stood out. 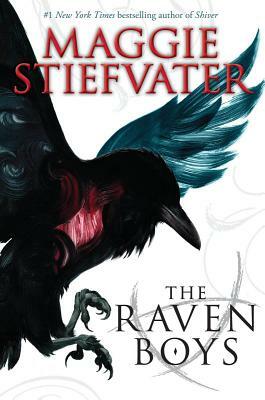 But rather, Stiefvater is eloquent in her simplicity. There’s nothing outstanding about any of the characters individually, and yet as a whole they become remarkable. The girl is Blue, the daughter of a psychic, who aspires to be “eccentric” but really is only “sensible.” She has been told since she was little that she would kill her true love with her kiss. Because of that, Blue has two rules: 1) don’t kiss anyone, and 2) don’t get involved with the Raven Boys. They’re the upper crust blue bloods that populate the pre-Ivy League boarding school in this small mountain Virginia town. Except rule number two changes after Blue gets involved with Gansey’s — one of those blue bloods with an affinity for a 1973 Camaro — quest to find a mysterious Welsh king he believes to be buried nearby. Gansey doesn’t come alone, but rather in a pack: there is Ronan, a hot-blooded Irish boy who has gone off the deep end since his father’s mysterious murder; Noah, who lurks around the outskirts of everything, but still is somehow part of it all; and Adam — the one Blue falls for — who has his pride and not much else. Their quest starts out innocently enough, but becomes increasingly darker as the book goes on. It’s this slow descent into the strange, supernatural, and eerie that kept me reading, not wanting to put it down. It was pointed out in the YAckers that it’s a good gender-neutral book: the love bits aren’t all smushy, and the male characters are pretty amazing. As is everyone else. I’m blathering. Just go read it (if you already haven’t). I really like the concept of the book, is this a stand alone or ends on a cliffhanger? I JUST gave this book to a 13 year old boy, and told his Mom she would enjoy it too. Great review! I have just reviewed this on my blog as well and have linked yours here in my post. I hope you don’t mind!